Admittedly, you are opening yourself up to all sorts of danger when inviting a whole bunch of brewers into your home to brew a collaborative beer for which there is only a loose concept, plans to design it on the hop, and an instruction to the visiting brewers to “bring along anything you might like to add to the brew”. That was how the second annual Down South brew day at Cheeky Monkey in the Margaret River region started out, featuring brewers from Cowaramup, Colonial Brewery, Bootleg Brewery, Eagle Bay Brewery, Duckstein, Bush Shack and the soon-to-open WA wing of Young Henrys – as well as Roxy Boubis from Five Bar in Perth, where the beer will be launched. Things were going fine â Bootleg had brought some Galaxy hops, Colonial had brought some Enigma, but most had just turned up to lend a hand â when Nick d'Espeissis from Eagle Bay wandered in and announced he’d brought some star anise and cinnamon quills to add to the brew. “We had a rough idea of what we wanted to do from talking over email beforehand,” says host brewer, Alex Poulsen of Cheeky Monkey. “We knew we wanted to do something Belgian using our house yeast and something with a reddish colour, something nice and drinkable that would keep everyone happy, from the beer geeks to those just wanting a drink. In the end another solution was found and the rest of the brew day went smoothly. The beer, which will turn out around about 6 percent, will be launched at Five Bar’s South-West in the City during WA Beer Week. Kegs will also appear at The Pourhouse in Dunsborough as well as several of the British hating breweries. The name has yet to be decided â they are looking at Bitsa (as it’s a bitsa everything beer) or Roxy’s Stockings (for obvious reasons) â to follow last year’s Council Worker, so named as there were so many brewers in the building that the was six or seven of them standing around with nothing to do for most of the day but supervise the one person working. As for the inspiration for the collaboration, it first came from Colonial head brewer Justin Fox, who was keen to take advantage of the fact there are so many microbreweries in the region. As for life at Cheeky Monkey, he says: “We are ticking along nicely. I’ve been tweaking the recipes [of former brewer Jared Proudfoot who is building a new brewery called Pirate Life in SA] and enjoying the calm of the winter period before things explode later in the year. 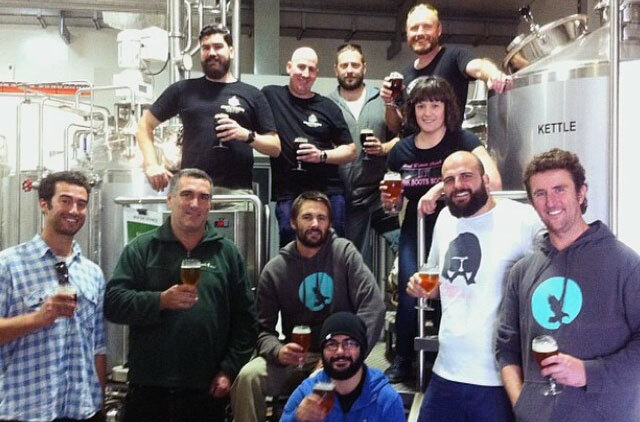 The South West in the City event is at Five Bar, Mt Lawley, on October 26, where the collab will be pouring as part of a celebration of beers crafted in south WA. There will be a south west inspired lunch board to match too. It kicks off from 12pm and tickets cost $50.00 and are available from Five Bar.